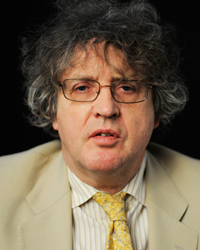 Paul Muldoon was born and raised in Northern Ireland and has lived in the United States since 1987. He is poetry editor for The New Yorker and the author of more than 10 collections of poems, including the 2002 Moy Sand and Gravel, which won the Pulitzer Prize for Poetry and the International Griffin Poetry Prize. He has also written rock lyrics for Warren Zevon and his own band, Rackett, in which he plays rhythm guitar. This recording is available for noncommercial and educational use only. All rights belong to the author. © 2010 Paul Muldoon. Used with permission from Paul Muldoon. ← Rita Dove | How Does a Shadow Shine?